Noordin Mengal, a Baloch representative at the UN Human Rights Council, stated that the Baloch people continue to face the brunt of the Pakistan military. The Baloch people continue to face the brunt of a full-fledged military campaign by the Pakistan military while the international community seemed unmoved by the atrocities, says Noordin Mengal, a Baloch representative at the UN Human Rights Council who has highlighted human rights issues at international forums. Speaking at a conference held alongside the 23rd session of the UN Human Rights Council in Geneva, Mengal said that the actual gravity of the situation in Balochistan needs to be understood. He said that as we speak, the people of Balochistan continue to bleed, suffer and mourn, as a military operation is ongoing in Balochistan. He said that Pakistan has continuously attempted to subdue the Baloch people’s struggle for their rights and has been usurping the wealth and natural resources of Balochistan. He said that the wrath of state-sponsored ’strategic assets’ has now fallen on the Hazara community of Balochistan who now are being indiscriminately and ruthlessly ethnically cleansed. 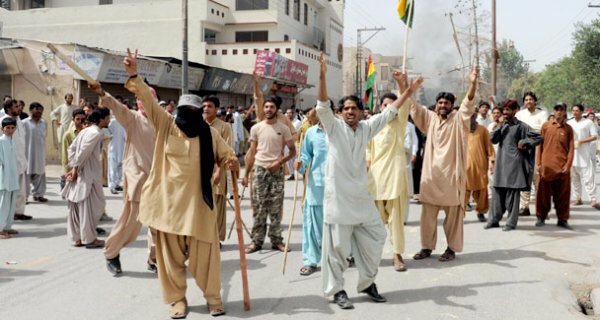 He said that the Baloch face overwhelming odds with assault on all their rights from all sides. He said that the Pakistani military blatantly represses and kills at will, the state sponsored fundamentalist death squads hunt the secular Baloch nationalists and kill ethnic Hazaras with impunity. He added that peaceful protesters are suppressed, political representatives arbitrarily detained and abducted and that freedom of expression and assembly is totally restricted, whereas fundamentalist elements are given a free hand by the establishment. He regretted that the mainstream political parties in Pakistan are content with paying lip service on the issue of Baloch rights whilst nodding to the military’s policies in Balochistan. He said that the judiciary has also buried its conscience and the media has compromised its responsibilities by turning a blind eye towards the injustices and atrocities against the Baloch. He said those few in the media that have raised their voices for the Baloch and questioned or highlighted the army and ISI’s actions have suffered grave consequences. “Thousands of Baloch have been abducted by the military and are subjected to the most inhumane and disturbing methods of torture in secret concentration camps,” he said. Mengal said that an organised and systematic policy of eliminating Baloch intellectuals, students, teachers, lawyers, doctors, political and human rights activists, young and old, is currently underway. He added that over 700 persons were abducted, tortured and extra-judicially killed in what Amnesty International has called the “kill and dump policy” in the past three years with thousands yet missing and their families yearning for their return. Condemning the growing network of military garrisons in Balochistan, he said this would give Pakistan’s army and intelligence agencies greater potential to further promote and facilitate the growth of fundamentalism and the construction of madrassahs in the secular Baloch areas. He said that the state’s intelligence agencies want to provide a harbour and breeding ground to radical elements to undermine the secular Baloch society and movement and ultimately reap benefits from endangering regional and global peace and stability. He said that it was disappointing and shocking that while the world’s focus lies on this entire region, it has still selectively ignored Pakistan’s atrocities in Balochistan. He said that the Baloch nation would continue its resolve to secure its rights, resources and identity, stand against undemocratic forces and ensure the security, peace and welfare not only of its own future generations, but the security and peace of the people of the entire region and the world, of all creeds and all races. “The Baloch will take a stand for humanity, but will humanity take a stand for the Baloch?” he asked. He added that the people of Balochistan hope that the UN and international community would act fairly, fulfilling their responsibilities. He said that the time has come for the international community to decide if they are with the oppressed people of Balochistan or with the military of Pakistan.